Percorra as dunas ondulantes do deserto em um camelo com este pacote privado. Aprenda sobre este modo tradicional de transporte antes de se preparar para o seu passeio relaxante. Prove café árabe típico (Kawa) ou chá fresco na sua excursão. Este passeio inclui transporte de ida e volta sem complicações a partir do seu alojamento em Dubai. 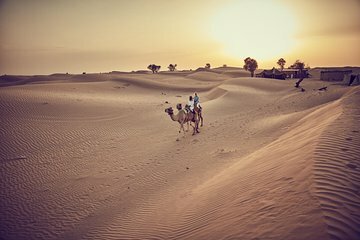 This tour has only one purpose - travel to a camel farm in the desert near Dubai from our hotel, ride on a camel for an hour and then get a ride back to the hotel. Nothing else. From that standpoint we got what we paid for. We asked the tour operator to pick us up from the airport once we arrive in Dubai. We expected (and communicated) that the driver would be waiting for us at the meeting point at the airport with a name placard. That didn't happen. It took us several costly cell phone calls to get the driver park his car and meet us at the meeting point. This part was frustrating as we were instructed to go from one place to another when the simplest thing would have been to park the car and meet us at the meeting point. We lost about half an hour. Once we found each other the rest of the tour was as expected. We were driven to the desert in a regular sedan which possibly was not a great idea as we got stuck in the sand on our way back and had to be pulled out with a truck by the camel farm workers. We didn't want or have time for any other activities so for us this was the best option but could have been planned better.